« Question of the Week: What’s the Libertarian Response to Terrorism? Back in 2010, I posted a “Moocher Index” showing the states with the most dependency. But that was based on numbers and lacked any human-interest angle. So let’s create a Moocher Hall of Fame for the individuals who best exemplify the culture of loafing, laziness, and dependency that is being subsidized by our vote-buying political class. But you don’t receive this honor simply by accepting other people’s money. Membership in the Moocher Hall of Fame is reserved for deadbeats who demonstrate some special characteristic that warrants their induction. * Let’s start with Olga, a Greek woman who earned membership in the Hall of Fame because she protested against the notion that she should be responsible for her own life since she might have to – gasp! – work more than one job and live at home. * Leroy entered the Hall of Fame after it was reported that he won $2 million from the lottery, but somehow is still collecting food stamps. * If the Hall of Fame had an award for going above and beyond the call of loafing, then Hans from Austria would be an obvious choice. He cut off his own foot to ensure continued handouts. * We also have a husband-wife team in the Hall of Fame. Alicia and Matthew were unanimous inductees after it was revealed that they tried to impregnate a 12-year old girl to increase their welfare payments. * Speaking of husband-wife duos, let’s not forget Danny and Gina, who bragged that it didn’t make sense for them to work when the government was providing them with enough loot to enjoy an apartment, a big flat-screen TV, and 40 daily cigarettes. * Last but not least, we have Natalijia, a Lithuanian woman who in now enjoying foreign holidays and designer clothes thanks to the generosity of British taxpayers, but nonetheless complained that she wasn’t getting a taxpayer-financed nanny. Quite a collection of scroungers. But I don’t think they’re very bright. They wanted to invite Julia to be the speaker at this year’s induction ceremony, apparently not realizing that she was a make-believe cartoon character created by the Obama campaign to celebrate dependency. Perhaps they should ask Obama to speak. After all, more people have latched on to the disability system during his presidency than have gotten jobs. Quite an achievement…of sorts. But I’m digressing. The purpose of this post is to announce the newest member of the Moocher Hall of Fame. Our proud new bum comes from Denmark. Known as “Lazy Robert,” he’s been mooching off the taxpayers for 12 years and he’s very proud of his lifestyle. Here are some inspirational details from a New York Times report. Robert Nielsen, 45, made headlines last September when he was interviewed on television, admitting that he had basically been on welfare since 2001. Mr. Nielsen said he was able-bodied but had no intention of taking a demeaning job, like working at a fast-food restaurant. He made do quite well on welfare, he said. He even owns his own co-op apartment. …Mr. Nielsen, called “Lazy Robert” by the news media, seems to be enjoying the attention. He says that he is greeted warmly on the street all the time. “Luckily, I am born and live in Denmark, where the government is willing to support my life,” he said. 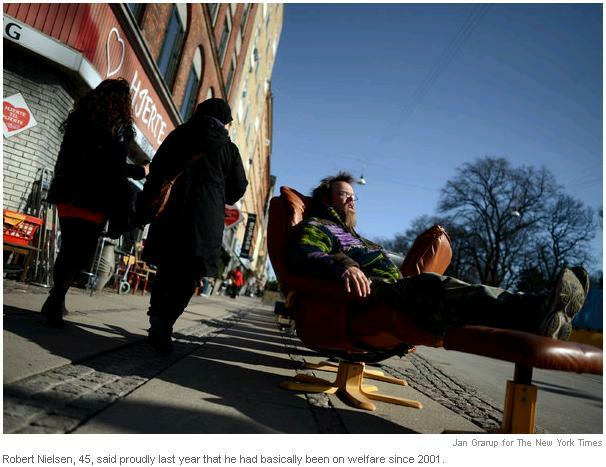 The story also mentions another Danish moocher. Her story is worth sharing because it shows how the folks riding in the wagon enjoy higher living standards than many of those pulling the wagon. Visit a single mother of two on welfare, a liberal member of Parliament goaded a skeptical political opponent, see for yourself how hard it is. It turned out, however, that life on welfare was not so hard. The 36-year-old single mother, given the pseudonym “Carina” in the news media, had more money to spend than many of the country’s full-time workers. All told, she was getting about $2,700 a month, and she had been on welfare since she was 16. This probably doesn’t bode well for Denmark’s future. As illustrated by this famous set of cartoons, this kind of system creates very perverse incentives. But there are some people who genuinely deserve something, and those folks are the taxpayers of Denmark. They deserve our sympathy. They have one of the world’s most oppressive tax systems, thanks in part to a welfare system that provides a comfortable hammock for Robert and Carina. First of all, a disclaimer: I’m happy I left Denmark and I don’t think I’ll ever regret it. Having said that, the NYT article actually increased my respect for Denmark: having a debate about welfare when their credit rating is still AAA? what other country would do that? Austria also looks good from this post: if you have to cut off your own foot to get benefits, then it’s hard to say that Austrian welfare is too generous. There are two separate problems with our current system: dependency and mal-incentives. Economically the best solution would be to cut off all redistribution and let charities support the truly needy. However, politically that is a non-starter. The politically acceptable solution would be to leave current redistribution levels in place [but growing at a slower pace than the economy] and get rid of mal-incentives. This can be done through a tax code that includes a “safety-net”. Such as system would replace deductions with expanded cash payments. This would create effective tax rates that go from negative to a maximum [25%?] rate in a smooth curve, avoiding the “dead zone” for Julia’s mother. Not only would this eliminate direct welfare payments by the federal government [states would be free to make up the difference], but we could eliminate minimum wage laws, reduce mal-incentives in unemployment and disability benefits, and reduce entitlement benefits by an amount equal to the “safety-net”.